In 1992, the Rio Summit created the Agenda 21 (action program for the 21st century). Chapter 28 concerned the implementation of sustainable development initiatives in regional and local authorities. In France, Local Agenda 21 is a voluntary process, conditioned by the will of the mayor or the president and that’s can explain the delay for adoption of local Agenda 21. Two events reinforced the interest of elected people in the SD Process: the Johannesburg Summit in 2002 and the Grenelle process in 2007. But the national and regional levels have developed soft incentives in order to encourage the political will. At the national level: The first National Strategy for Sustainable Development 2003 - 2008 has set a goal the development of Local Agenda 21 to 500 by 2008. 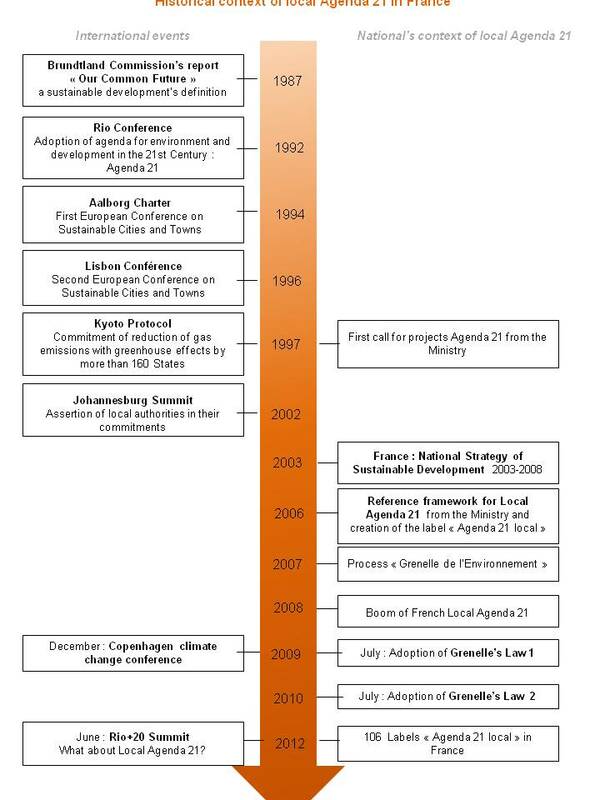 The new National Strategy for Sustainable Development 2009 - 2013 has even set the more ambitious goal of 1000 Local Agenda 21 in France by the end of 2012. In order to achieve this target, the State has deployed support of Local Agenda 21. At the regional level, regional agencies for environment or SD provide technical and financial support to the SD process of the local authorities. They exist in Midi-Pyrénées, Nord-Pas-de-Calais, Ile-de-France, Rhône-Alpes, PACA. Most of them have been created in the 1990s and they are federated in the RARE (Réseau des Agences régionales pour l’environnement). Local Agenda 21 is more numerous in the regions where regional agencies exist. Since 2010, regional administrations of the Ministry of SD “DREAL” are in charge of providing technical (and a little bit of financial) support to Local Agenda 21 and animate regional networks of engaged local authorities, called “Comité regional Agenda 21”. Some regions or departments have soon understood that they had to support the local authorities of their territories to make them contribute to the sustainable development of the region and to articulate their action. Their help is both individual (bring a financial and technical support through request for proposals) and collective (drive regional networks of engaged authorities). We can find examples in the region Centre, the Conseil general de la Gironde and the Conseil general de l’Hérault. In Gironde, 61 local authorities are engaged in an Agenda 21 and federated in the Conseil départemental des Agenda 21 (CDA21). The region Pays-de-la-Loire transferred this mission to the first regional Comité 21 (an association). Some groupments of municipalities have followed this example, such as Plaine Commune: both the Communauté d’agglomération and the 8 municipalities of the territory drive their own A21 and aim at articulating their processes. Click here to see this example.